Their debut release was a five-song mini-album called "Trouble" which was released in January 1990, around the time of their tour supporting Dan Reed Network. This helped showcase Alfonzetti's blistering vocal performance and Gray's titanic onslaught. The debut full length album, "Fuel For Your Soul" was produced by Jeff Glixman and included fantastic songs including the glorious "You Don't Love Me". 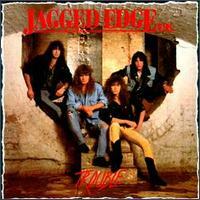 Jagged Edge toured quite a bit during 1990 and 1991, including support slots with Thunder, Bruce Dickinson (who coincidentally had Dicki playing drums for him on the tour - Fabio had been the drummer on Bruce's album "Tattooed Millionaire"), and David Lee Roth. They also headed out on their first headline tour in November 1990, which included a date at London's Marquee Club. Halfway through this show the power suddenly died - but the band just carried on with Matti singing and the audience joining in until the power was restored. True Class!! In July 1991 the band played at the Cumbria Rock Festival - it had been raining all day but as soon as they hit the stage the sun came out! The next day they played a gig at Walsall Junction 10, which turned out to be their last ever gig - July 14th 1991. Sadly by the end of the year the band had split up and Myke & Andy went on to form SKIN. * These two tracks were extra tracks released on the CD version of the album only.